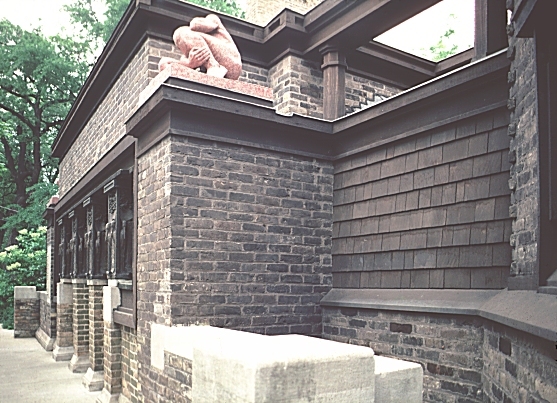 Images of Wright House and Studio, 1889 and 1898, by Frank Lloyd Wright at Oak Park (Chicago). Digital Imaging Project: Art historical images of European and North American architecture and sculpture from classical Greek to Post-modern. Scanned from slides taken on site by Mary Ann Sullivan, Bluffton College. 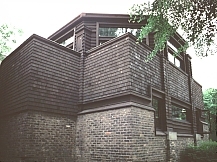 Wright lived and worked here from 1889-1909. 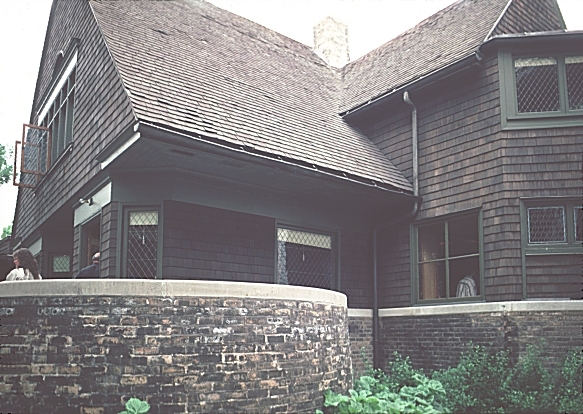 The house was remodeled in 1898 with a large studio section added to the north (left) of the house. At that point Wright moved his architectural practice to his studio. The house and studio are on a corner lot with the front (west) facade facing Forest Avenue and the studio/office addition facing Chicago Avenue. 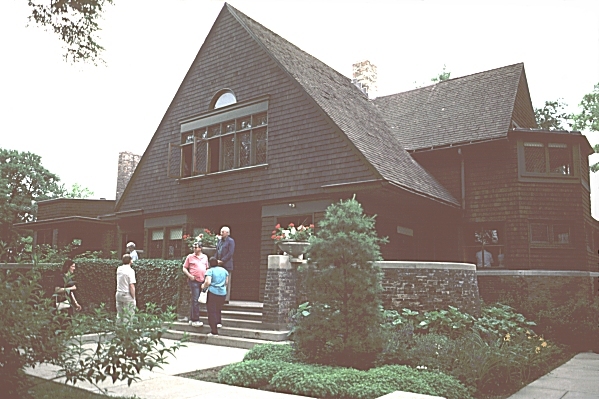 The house, essentially in the Shingle style, has brown shingles with green trim, a large sheltering and over-scaled roof, a lunette window under the peak of the gable, and a clear entrance (unlike many of the later Prairie style houses). A large veranda, with a tall masonry wall, circles the front. In 1895, with an expanding family, Wright added an east wing at the rear of the house. 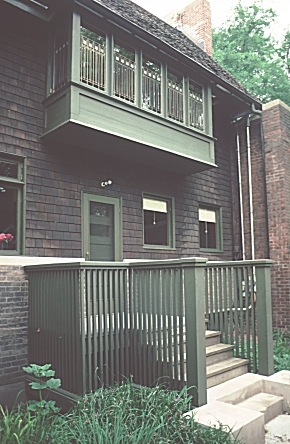 This south side entrance was added as well as a playroom on the second floor, a bay of which is cantilevered above the entrance. 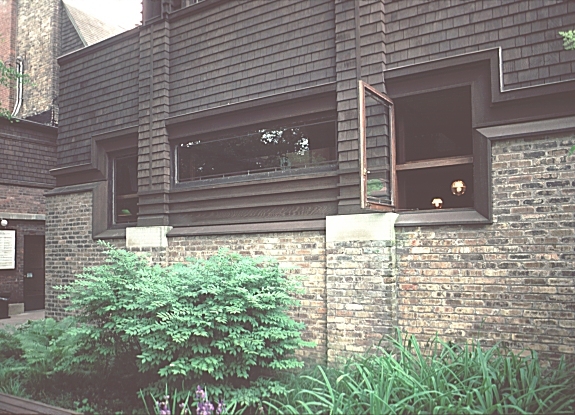 In 1898 Wright added the studio section to his house on the north side, facing the street. This section has three units asymmetrically arranged--a library/conference room at the front, a connecting reception area (with the business entrance to the studio), and a large drafting room for as many as eight apprentices. Wright's private office was behind the reception room. Both the library and drafting room have octagonal drums, similar solid lower walls, high windows, and light coming from a roof skylight. A small loggia with entrances at both ends fronts the reception area. 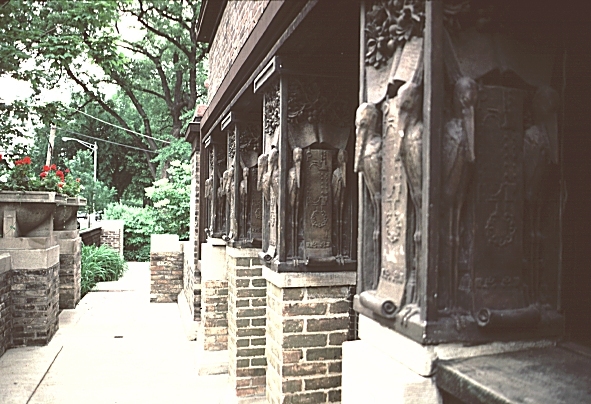 A terrace wall with limestone urns (see above right) protects this entrance. 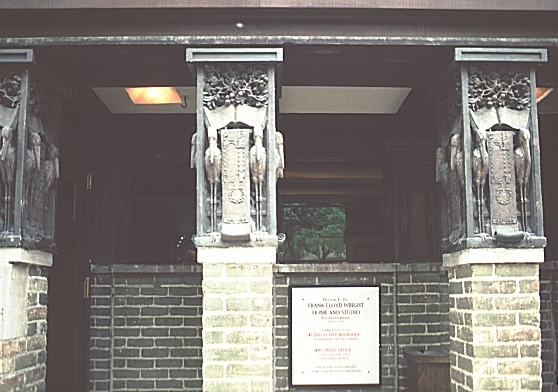 The loggia columns are topped with a symbolic design. "The book of knowledge issues from the tree of life, a symbol of natural growth. A scroll of architectural plans unrolls from it. 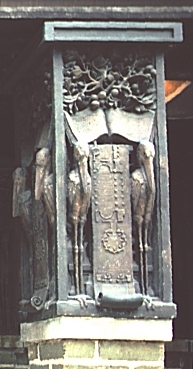 On either side are sentry storks, perhaps symbols of wisdom and fertility" (Ann Abernathy, from the official guidebook to the House and Studio). 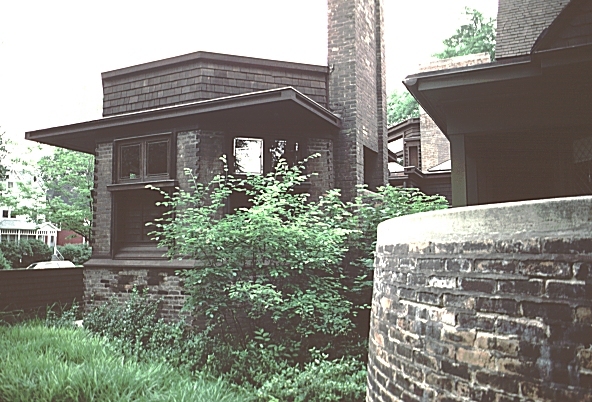 Other houses on this site by Wright in Oak Park include: Peter A. Beachy House, Arthur Heurtley House, E. R. Hills House, Nathan G. Moore House and Stable, and Frank Thomas House.